brings with him a sea of converging influences, each set to a rhythm – of freedom, rebellion, humanity, cut to song and poetry. Where else, or who else, or when else will you see a man whose life took a U-turn after reading the poetry of Rabindranath Tagore, in Cuba, has been the Culture Minster of his country Cape Verde, who received the Lifetime Award as a musician at the World Music Expo as Culture Minister of his country, and been a champion of freedom music, like the legendary Bob Marley, through the unique rhythms of ‘Funana’, born of the same spirit as reggae and salsa! Lúcio Matias de Sousa Mendes or simply Mario Lúcio is all of that and so much more. 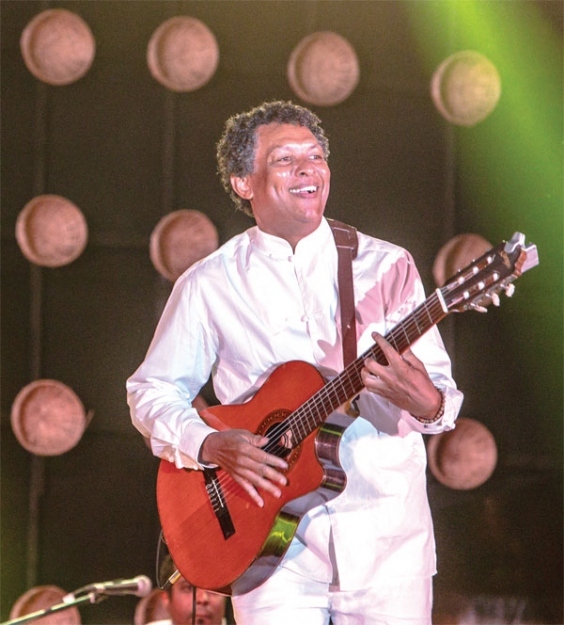 Mario is in Goa, another land of the erstwhile Lusofone countries, with his fellow performers Priscilla Ferreri (singer), Danile Rocha (percussion) and Sori Araujo (guitar), to perform at the Sur Jahan World Peace Music Festival 2019 that is being held at the International Centre Goa (ICG). Incidentally, the Portuguese presence in Cape Verde of around 500 years matches their presence in Goa. “If music be the food of love…( and life)... play on,” said Shakespeare (Twelfth Night). Mario did just that. He played on. But it was poetry and Tagore that became his first love. As a fifteen-year-old born in the North Western African volcanic archipelago of Cape Verde, young Mario became a newspaper reporter, wanting to devote his life to writing and poetry. The search for more education took him to the climes of Cuba, where his early passions were watching an orchestra and going to the library for which he put aside money. It was at the library in the University of Havana, where he came across an anthology of Tagore’s poems, which he read for a year. “I call him my saint poet. Along with Pablo Neruda of Chile, Tagore has been my greatest influence,” he states. Back in Cape Verde, Mario studied law but his music and poetry continued unabated, though with an interesting detail. He wrote and sung all his songs in Creole (a language born out of Portuguese and African roots) but his poetry was in Portuguese. When I sing, the words come out in Creole and when I write, it flows in Portuguese. His work is clearly true to life and touches upon the flavour and the fragrance of his soil, his roots and his influences, like the percussion instruments his band uses like an iron and a knife. The arrival of the Portuguese on the uninhabited islands of Cape Verde and they meeting the Africans who came to the island, started a new association. This is touched upon his book ‘The birth of a world’. Reminded about the close links Goa has with the Portuguese-speaking world, Mario is quick to point out a fundamental difference. “In Goa, there was an existing local population that met the Portuguese. Cape Verde was deserted. There were no people. The people came later and both, the Portuguese and the Africans, started together and they combined to give us the Creole language (the language of his music),” he reveals. But this isn’t the language of only words and its grammar is not the embodiment of its script alone. Much of the seamless rhythm of Mario’s music and that of his country comes from the feeling of being free and liberated. So when Cape Verde became a republic, the music too was a celebration of this and was portrayed in its sensuousness. And there’s a term for this – ‘Funaná’. Funaná is actually a feeling. It is dancing, it’s a song inviting you to dance, it is an uprising, it is a rebellion and finally it is a victory, in the form of freedom (which many African nations achieved). It is unique as well as universal. The soul of reggae can also be found in Funaná, because the singers came from the same life challenges. His life and work is an embodiment of culture, which is why he was invited by the Prime Minster of Cape Verde to be the Culture Minister of the country (where men and women of proven excellence are handpicked to hold key ministerial positions without contesting elections). This did not stop his writing or his music –four to five books of poems, three CDs of music with others including his band Simentera and three solo CDs, each have belonged to the ravenous plume of creativity of this cultural activist. Mario was named Cultural Ambassador of Cape Verde in 2011 and received the lifetime WOMEX (World Music Expo) 2014 Professional Excellence Award at Santiago de Compostella, Spain, when he was still the Culture Minister of Cape Verde. Songwriter, cultural ambassador and charmer... He is here.